Dr. Jeffrey Nguyen is a native of California. He was born and raised in San Jose and attended UC Davis where he earned a bachelor degree in biochemistry and molecular biology from the College of Biological Sciences. He then matriculated and earned his dental surgery degree from the prestigious UCLA School of Dentistry. He was distinguished from his peers by his work in outreach within the underserved communities in Orange County and traveled abroad providing dental services in Vietnam. He is fluent in Vietnamese. 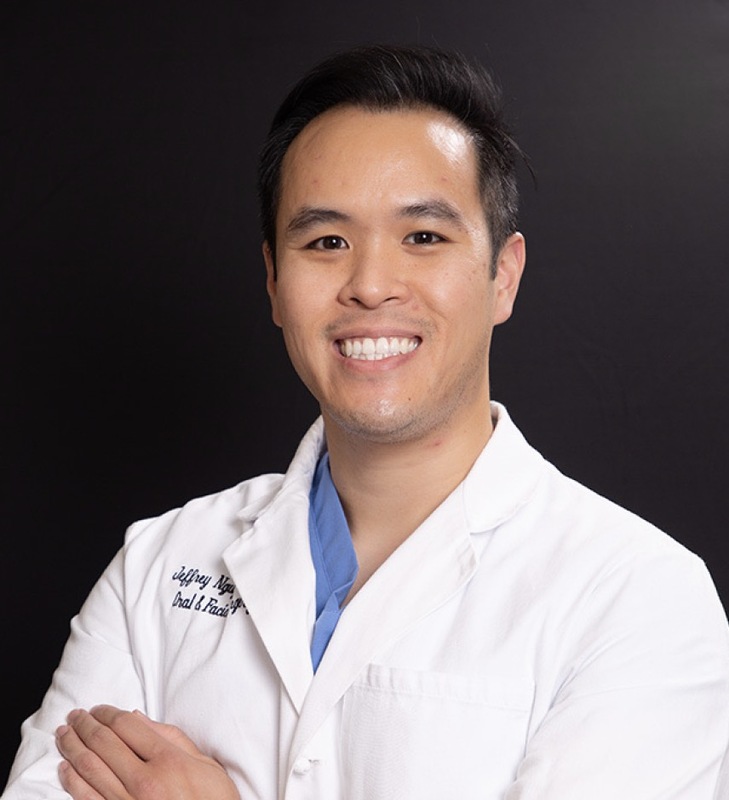 After completion of dental school, Dr. Nguyen continued his education at the University of Connecticut oral and maxillofacial surgery 6-year residency training program. In this time, he completed the requisite years in oral surgery, earned his medical degree from the University of Connecticut School of Medicine, and received a certificate in oral and maxillofacial surgery. In his final year of training, he served as the chief resident in oral and maxillofacial surgery at Hartford Hospital, Connecticut Children's Health Center, St. Francis Hospital, and John Dempsey Hospital. He is Board Certified by the American Board of Oral and Maxillofacial Surgeons. He is licensed to practice both dentistry and medicine in California. His training in residency was extensive and covered a broad scope of oral and maxillofacial surgery which included dentoalveolar surgery, implant and bone grafting surgery, facial trauma/reconstructive surgery, craniofacial/cleft surgery, diagnosis and treatment of pathology, and cosmetic surgery. His general surgery years gave him exposure and experience in managing the intensive care patient, managing complex wounds and infections, plastic surgical procedures and techniques, and trauma surgical care. He received a two year certificate from the University of Connecticut general surgery department. Dr. Nguyen lectures regionally educating dentists about advances in oral surgical care. Most recently, he's given lectures about Botox and the management of medical emergencies in the dental office. He partnered with Straumann and hosts a study club in Costa Mesa dedicated to the advancement of implant and bone grafting surgery. Dr. Nguyen's wife is a full time clinician at the University of California Irvine Gavin Herbert Eye Institute. They met while he was a student at UCLA and she was studying at UC Irvine. Together, they live and practice here in Irvine.